CHAMPIONS!!!!! 3 BIDS TO USA! 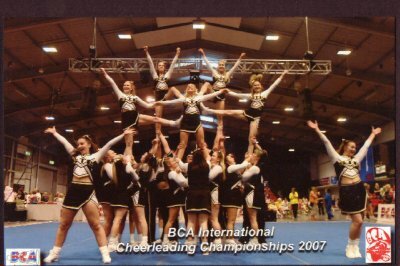 Sussex Tornados Travelled to Telford Thursday night ready to compete in the BCA Nationals 2007. Friday we entered Junior allgirl, Junior Coed, Senior Allgirl and Senior Code Group Stunt,Senior Trio and senior dance medium. Saturday Junior and Senior Advanced COED. Sunday Junior and Senior advanced Coed and Senior dance Medium. Junior Allgril Group Stunt took to the floor first thing friday morning, Flyer Lauren had never competed in group stunt before and they did an awesome job, every stunt hit and they even added in some extra twist outs that we were not expecting. Their Music got stuck half way through but they still carried on going. Great Job Girls. Junior Coed Group Stunt walked away CHAMPIONS!!!! They did a great job, Special well done to Becca who took craigs place 2 weeks before the competition, Every stunt hit, and they obviously won the judges over. Great Job!! Senior All Girl Group Stunt always have the hardest division along with Junior all girl group stunt. They worked really hard on their routine, which was jam packed with great stunts, and walked away with 5th Place out of 13. AWESOME!!! Senior Coed Group Stunt were fantastic, Everyone comented on how high our baskets were, and we had lots of new and different stunts that were fantastic, a couple of little blips but well covered by all. "2nd PLACE at Nationals.... WICKED!!! Senior Trio - 3RD Place......... WOW. This is the first time we entered this division, and BCA Dont have seperate rules for trio so we wasnt sure if what we were doing was illegal and we wont know until we get the score sheets, but they did a fantastic job, they were up against squads that have competed in this division more than once, and they managed to pull off a 3rd place trophy... WELL DONE! JUNIOR COED ADVANCED..... CHAMPIONS!!!! They did everything they were taught, and they looked amazing. Double twist baskets which were added in last min and full libs that were so tight!! We had a lot of peewees come up for this competition and had to work so hard, but every single one of them pulled it off. Awesome 1st place well deserved. Made a nice change not to be the only ones in this division!! senior coed advanced - WOW The picture says it all, 1st day was a little shaky, but the 2nd day saw every stunt hit, and we enjoyed every min of it. We didnt recieve a trophy placing, but we couldnt of done any better than what we did. Just need to up our game for the next comp. Great Job Seniors!! SENIOR DANCE - 7th Place..... STC Have never competed in dance to win, we always do it for a bit of fun and a chance to go on the floor with no worrys of the stunts not hitting, and boy did we enjoy it. The crowd loved us and what an achievment up against dance schools. We will not be able to afford to take up all 3 bids but we will be working our butts off to fund for at least one..... WATCH THIS SPACE FOR MORE DETAILS!! !